OPEN HEART. year: 2007 | medium: Metal | technique: SERIGRAPH ON STAINLESS STEEL | edition: Limited | EDITION OF 900,SIGNED AND NUMBERED |. 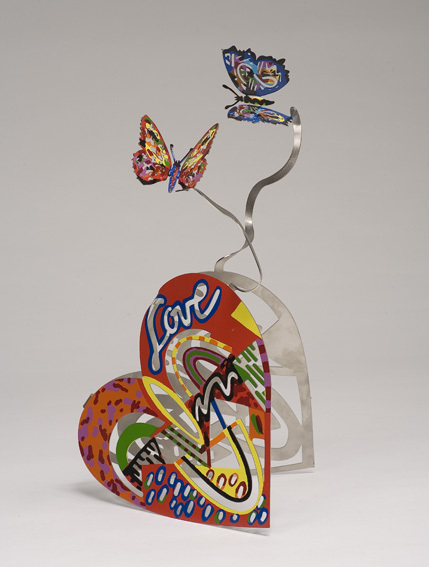 David Gerstein seeks to expand the limits of two-dimensional paintings into three-dimensional sculptures. In his choice of subject matter he wishes to break down the existing barriers between the work of art and its audience by creating enchanted and straightforward images, which render, at times, intimate, dream-like na?ve scenes and at other times, cinemascope-like, large scale, choreographed events. His easily recognizable artistic colorful syntax have developed gradually, reflecting a search for a distinct voice, which ranges from the local to the universal and echoes several levels of representation simultaneously.